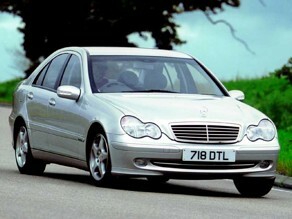 Mercedes C-Class (2000-2006) - Car Reliability Index | Reliability Index | How reliable is your car? While the C-Class has always sat in the shadow of the 3-Series and A4, it's a great car with some brilliant engines and is surprisingly well equipped. However, early cars weren't as well made as you'd expect, although post-2004 cars are much better. Whether you buy petrol or diesel, you'll love driving a C-Class. 9/00 C-Class launched in saloon form. 5/01 Estates come on stream, along with Sport Coupé. 8/01 C32 AMG joins range. 6/02 Panoramic glass roof now available on Sport Coupé. 6/03 Range is bolstered by C200 CDi. 2/04 V8-powered C55 AMG appears. Range is also facelifted with revised nose and tail along with improved heating and ventilation. Front tyres can wear at different rates relative to each other. Six-speed manual gearbox is usually rather notchy; you'll have to live with it. Wind noise around the doors is caused by poorly fitted seals. Check for clouds of black smoke under acceleration with diesels; turbo seals fail readily. Heated rear window packs up. Battery goes flat surprisingly quickly, if left for a few days. Diesel engine glowplugs can fail after just three years. Paint is sometimes poorly applied, especially with solid colours. Check all electrics work as they should - they often don't.